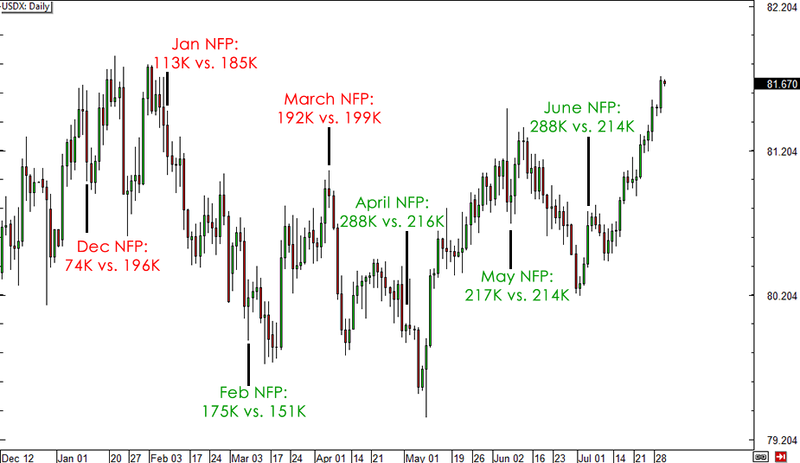 Was the July NFP Report THAT Bad? Newsflash! The July non-farm payrolls figure fell short of expectations as it showed a mere 209,000 rise in hiring versus the estimated 231,000 gain. Meanwhile the jobless rate ticked up from 6.1% to 6.2% and average hourly earnings stayed flat instead of printing the estimated 0.2% increase. Judging from the Greenback’s reaction to the report, it appears that market watchers were very disappointed with the U.S. jobs data. The U.S. dollar index slipped from the 82.000 area to a low of 81.654 moments after the release, with USD/JPY dropping by close to 70 pips and EUR/USD popping back above the 1.3400 handle. But was the jobs report really THAT bad? While the headline figures missed expectations, some might argue that a gain is still a gain, as the U.S. economy did add more than 200,000 jobs during the month. Besides, doesn’t Uncle Sam deserve more credit for being able to maintain jobs growth of over 200,000 consistently for the past six months? The last time this happened was in 1997! Apart from that, the June data was upgraded to show a 298,000 increase in employment from the initially reported 288,000 rise while the May NFP figure was also revised higher from 217,000 to 224,000. A closer look at the components of the report shows that hiring gains were made mostly in the construction industry and in factories. In addition, the rise in the jobless rate for July was actually spurred by an INCREASE in the participation rate. While the U.S. economy used to be bothered by a falling participation rate, which indicates that Americans are dropping out of the labor force and giving up looking for work, the latest jobs report revealed that people are returning to the jobs market in search for a full-time job. The lack of wage growth remains a concern though, as this could potentially weigh on consumer spending later on. Personal spending data already came in weaker than expected for the month of June at 0.4% versus the estimated 0.5% increase, even as personal income came in line with expectations at 0.4%. Bear in mind that Fed Chairperson Yellen is also keeping a close eye on wages in evaluating whether the U.S. labor situation is improving or not. Speaking of Fed policy, the latest NFP release appears to confirm what the FOMC minutes have indicated. While Fed policymakers acknowledged that there were noticeable improvements in the jobs data, there’s still a sufficient amount of slack left to be absorbed and that the upbeat figures are not enough to convince them to switch to a more hawkish stance. Do you think the U.S. dollar is in for a selloff for the next few days? Share your thoughts in the comment box or vote in our poll below!